Digital marketing campaigns often result in some of the highest conversions of any marketing activities. Traditional marketing tactics are no longer enough to stay competitive. Customer expectations have grown significantly over the last few years and they will continue to increase. With the ease and immediate gratification of locating information in their personal lives, consumers now expect the same level of service and convenience in their work lives. These new demands create a challenge for marketers in the B2B space as marketing budgets are often smaller than those of B2C companies. There are many new trends and technology innovations in the digital marketing space and you should consider them carefully before building a digital marketing budget for 2018. Take time to learn about the new technologies available to amplify your efforts. You may not be able to take advantage of all the options, but a thorough review of the technologies and a realistic analysis of your target market will direct you toward the innovative new approaches that make sense for your business. Expect to see a continued shift toward video content. Video streaming was 75% of all internet traffic in 2017 and there are no signs showing things will slow down. Studies found viewers watch live streams 3x longer than prerecorded video. In fact, video distributed in any number of digital formats continues to generate significantly better results that static images or copy alone. There is an important evolution in the quality and style of the most successful videos, however, most notably the preference for live streaming. Live video is more appealing to audiences: 80% would rather watch live video from a brand than read a blog, and 82% prefer live video from a brand to social posts, according to livestream.com. Explainer videos have also taken on a life of their own. These are particularly useful for companies that solve complex problems and need an easy way to explain their solution. Wirebuzz.com reports that on websites where an explainer video is present, visitors are 4x more likely to watch the video than to read text on the page. When a question or need arises, our phones are far and away our most trusted resource, with 96% of people using a smartphone to get things done. Incorporating mobile into marketing plans has become a necessity vs. a nice-to-have. Optimizing your website for mobile devices should be priority number one if you have not already. Secondarily, optimize videos for mobile as well. These additional efforts make a difference as consumers have high expectations and are accustomed to seeing high quality videos from consumer brands. With 60% of American adults using smartphones and tablets to search for local product and service information, you will want to determine whether Geofencing is right for your company. This local search technology pushes customized campaigns to your target market when they move into a specific, pre-determined geographic region. Business Intelligence (BI) – The influx of actionable customer and target market data is one of the most significant factors influencing marketing strategies today and this trend will continue to grow. The data these systems provide enables better informed decisions on marketing campaigns. For instance, you may discover that small businesses are more likely to respond to campaigns that include video than large enterprises. Further you may be able to correlate those response rates to a higher close rate by tying marketing automation information together with your deal tracking and accounting systems. Research Business Intelligence solutions carefully before choosing one. Some are designed for specific industries, provide simpler customizations, or are available via the cloud, for example. This is a significant purchase and will be used by multiple departments across the company, so be sure to collaborate with your sales and IT teams. Artificial Intelligence (AI) – There are multiple places where AI plays in the new world of marketing automation. Chatbots are one example that is growing quickly. Chatbot solutions provide automated responses based on contextual scenarios and previous answers that have been “learned” by the tool. This is an efficient and cost-effective way to meet customer expectations by providing real-time responses to customers to customer inquiries without the overhead of a human resource. Influencer Marketing – After having moved through an era where corporate marketing meant professional, formal, and perfect, people are now hungry for authenticity. If you are actively engaging your social community with customized content, streaming videos, etc., it may not be too difficult to acquire “influencers.” These are people who genuinely find value in your product and want to promote it. They may even enjoy fielding questions and providing referrals. Influencers can be powerful promoters, especially if you find ones who have great online reach. The key here is to ensure complete transparency with your community. You should avoid compensating or otherwise persuading your influencers to say anything that is not authentic to them. This should be content created by your influencers, not you. Once you understand the digital marketing options that are available, you will be able to identify the ones that will be of value to your business. Put careful thought into exactly how you will use each method and do your homework on costs so that you can accurately budget. 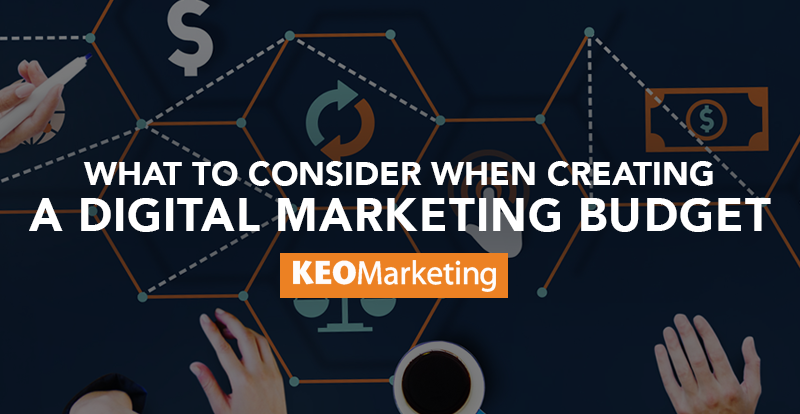 Measure your digital marketing budget against benchmarks to be sure you are not underfunding or overcommitting. 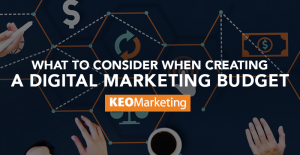 Finally, if you are incorporating new digital marketing approaches, consider whether you need to rebalance your in-house team vs. outsourcing budget. Marketing insights and best practices from this blog will be delivered right to your email box. With more than 20 years of hands on marketing strategy and operations experience, Sheila Kloefkorn is dedicated to developing marketing strategies and plans that help clients succeed. Some of the world's largest brands have depended on Sheila for marketing programs that delivered tangible and substantial results. Specialties: B2B marketing, lead generation, lead nurturing, sales strategy, marketing strategy, competitive marketing strategy, social media, search engine optimization (SEO), search engine marketing (SEM), mobile marketing,, email marketing, website design, marketing plans. Account Based Marketing vs. Lead Generation: Which Generates Better Results?